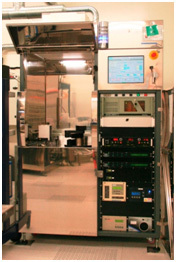 A stand-alone, single wafer etcher with one reactor, equipped with a cassette-to-cassette system with automatic robot handling. The reactor has a decoupled, high density ICP plasma source. It is designed specially for deep reactive ion etching (DRIE) and high aspect ratio etching of silicon using the Bosch (switched) process. On this tooI only, there is an option of using pulsed low frequency (LF) substrate biasing which can help to minimize the notching phenomenon when stopping on a dielectric layer. It is also used for (continuous) RIE etch processes such as etching of dielectric materials like SiO2 and Si3N4, and organic materials, as well as shallow, very accurate etching of Si.